Sabang is a beautiful island with an impressive coastline, white sandy beaches and crystal clear water, ideal for snorkeling and scuba diving on Sumatra. Sabang is a beautiful island with an impressive coastline, white sandy beaches, and crystal clear water. The island is ideal for snorkeling and scuba diving on Sumatra. The most famous bays on this island are the Gapang bay and the Iboih bay on the island of Rubiah. You will find here an impressive underwater world with coral reefs and a underwater visibility of up to 25 meters. For diving fanatics: you can also dive towards shipwrecks. As you will notice when you reach the island, it is actually a volcano. As a result, underwater craters, hills, and canals have been created by natural forces. The surrounding sea is up to 600 meters deep with coral reefs in the shallow parts. The combination of a relatively strong sea current guarantees a large variety of fishes. It is, therefore, a great destination for snorkeling and diving fanatics. To go to Sabang, you should take the ferry from Banda Aceh. The trip by ferry takes about 1 hour. Would you like to receive more information about this destination? Send us a message and we will be happy to advise you on a trip towards Sabang. After the opening of the Suez Canal in 1869, the Indonesian archipelago was no longer approached from the south, via the Sunda Strait, but along a more northern route, via the Malacca Straits. After 1890, regular shipping lines were established by the Koninklijke Paketvaart Maatschappij (Royal Dutch Package Company), the Dutch Steamship Company and the Rotterdam Lloyd. 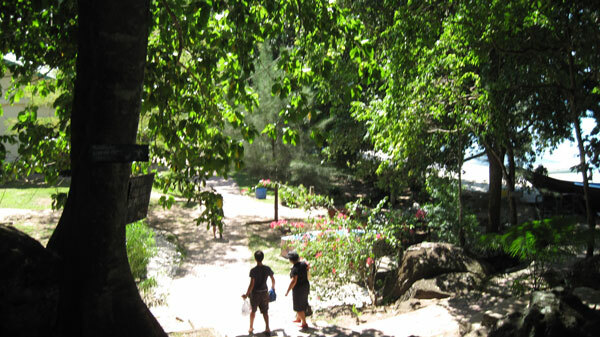 A coal depot was established in 1894 in the natural harbor of Sabang on Weh Island. Sabang is the town on Pulau Weh or Weh island, but most people call it simply ‘Sabang’ when referring to the island. The bay of Sabang is absolutely beautiful. During colonial times, the harbor was named after Princess Emma of the Netherlands, mother or the former Queen Wilhelmina, who was queen during the heydays of Dutch colonial rule. Sabang was important as it was the first harbor in Indonesia where the big passenger ships from Europe could dock. 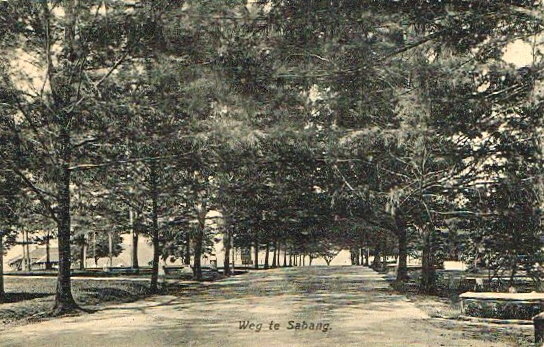 Shortly after Louis Couperus, the Dutch artist Harm Kamerlingh Onnes visited Sabang in January 1923. Harm also wrote about the beautiful bay and the picturesque city of Sabang and made a fine drawing of the harbor. And like Couperus, he also visited the head of the Sabang Company, Baron van Aerssen van Beijeren van Voshol, who was a personal friend of Harm. The house of the Baron is still there and a stone inscription has been put in front of the house. 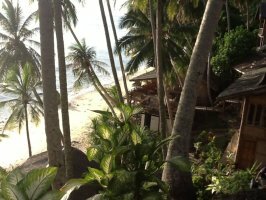 The best-known guesthouse on Sabang is Freddies Guesthouse in Sumur Tiga, just outside Sabang. The guesthouse has an idyllic private beach, cozy cottages and a kitchen that serves delicious meals. We can organize a trip for you to Sabang. Ask us for the possibilities and prices.